"I can't help it, there's something about this island." It's curious how the variables in the tried and true horror formula seemed to get muddied over time. We tend to lose ourselves within high-tech effects, over-the-top schemes for new "twists" and tons of blood and guts; often missing the real value of the basic scare. Tower of Evil takes us back to the basics of the horror genre, delivering a good scare without all of the excess hype. I have to admit that I was smitten by the 'new-fad' horror bug. Anxiously waiting for the next horror sequel to come out to see if it could outdo the 'gross-and-gore' factor of the previous. Not to say that these movies aren't horror, but better labeled as "slasher" movies, a type of movie that scares you visually. Sitting down to watch Tower Of Evil, I thought, "I know I won't be scared by this movie", but as I watched, I curiously found the hair on the back of my neck standing up! I couldn't believe that I was actually getting into this B-class horror movie. 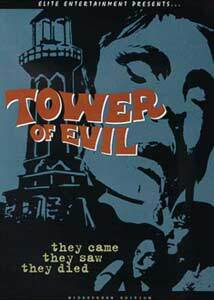 Although Tower Of Evil has gone through several title changes (Horror On Snape Island, Beyond The Fog—and it's current incarnation—Tower Of Evil), the content of the movie remains the same. A group of American teenagers get mysteriously murdered on Snape Island, and shortly afterwards a group of archaeologists set out to uncover the mystery of an ancient Phoenician treasure rumored to be hidden somewhere on Snape Island. They are joined by a detective hired by the parents of the murdered kids. The horror then begins. As far as horror movies go, Tower Of Evil does a good job of creating atmosphere, from which the actual scare comes. Although technically it doesn't shine (with the use of obvious plastic molded body parts strewn about the set), I would venture to say that if this movie had been presented with better, more modern props, it would have been a superior overall presentation. As is the case with most horror movies, the element of surprise is used throughout, the good thing here is that the timing isn't always predictable as it can be with other horror movies. Take a look at the opening scene when Hamp and his father are searching the island. You know something is about to happen, but you can't really get a grasp on when, so when it does happen you actually get a little scare. The script for the movie is about as basic as they come, and the actors don't really pretend to deliver any more emotion than what's written in the script. They even have trouble presenting the pseudo-sexual content with much gusto. With lines like "Man, I happen to get the only girl in Europe who doesn't want to get laid," the level of emotional content leaves little to be desired. The funniest delivery had to be Fredric Abbott (Saul), without spoiling any moments of the movie, you just have to see his antics and you'll know what I'm talking about. There are some hints of what could have been from the director, moments of great vision, but I guess given the time frame (and budget) Jim O'Connolly did his best with what he could. Image Transfer Review: The image on this transfer looks decent for a 1972 movie. Colors are somewhat muted, but there's no bleeding and the contrast levels are very good. There seems to be some slight graininess on some of the opening scenes, but this clears up shortly into the movie. Black level is very good, most of the movie takes place at night, in fog and in the caverns of Snape Island, and you never get lost in grays or unclear dark images. There are not visible scan lines or noticeable edge enhancement at play here. As always, this movie could have benefited from an anamorphic transfer. Nice, but not reference quality by any means. Audio Transfer Review: The audio is 2.0 mono, so you shouldn't expect any creepy sound effects coming from any of the rear speakers. The vocals are clean without sounding too tinny or muted, but given the dialogue presented, it would have been nice to have a music-only soundtrack. LFE is non-existent. This movie could have benefited from a new audio mix with some additional effects either routed to the fronts or some to the rears, which would have given this movie a more eerie feel. Don't expect much from the audio on this DVD. Extras Review: The original theatrical trailer is the only extra included with this DVD. It's of interest to see how much marketing and movie presentation has changed since the 70's. The extras are a big disappointment. This is a surprisingly decent horror movie that I was glad to have seen. Not that I'm a horror fanatic, but I do appreciate a good scare now and then. For those who are into horror, I would have to say that Tower Of Evil won't dissappoint.